It's Saturday, and the week is done. I gotta tell you, I'm a little sad. 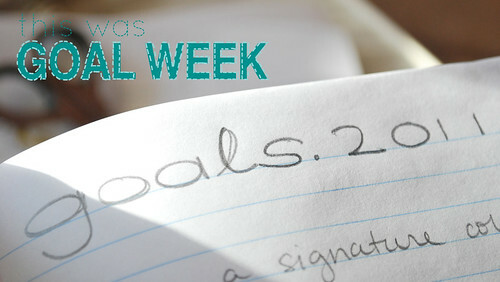 Spending this whole week sharing my goals for 2011 has been so inspiring to me. First of all, looking at each one and thinking about it enough to blog about it really helped me get my head around these goals. Instead of a list of things that I'd like to do, I have a thought out look at things for the year ahead. Sort of like planning to make a plan. But then, just to help the whole thing along, you have all been so encouraging. I feel seriously supported, and I hope that I can do the same for you. If there's one extra goal that I wasn't planning on, it would be to do more to connect with and help other bloggers. Kind of like my collaboration goal, but it feels like it is becoming a much bigger and better thing that I could have dreamed up on my own. So, I hope that you've enjoyed Goal Week as much as I have. If you missed any posts, they are all tagged goals for easy finding later. I'll be back Monday with regularly scheduled fun! Love your new header! How cute!